Does ozone kill mold or bacteria? Mold spores are all around us and in many cases they are inert, just waiting for the right environmental conditions to grow. Unfortunately, molds can grow very quickly and black mold in particular is known to cause many health conditions in humans and animals. The good news is that it can be treated effectively and eliminated. Our environment is also full of pathogens such as viruses and bacteria. In fact, the water supply is chlorinated to get rid of many of these harmful pathogens. But as anyone with young children will know all too well, many types of pathogens can live on surfaces such as door knobs, just waiting for someone to pick them up and host them. These pathogens can also be treated effectively with the right technology. Why Does Mold Grow and Where? Most of us understand that germs such as bacteria and viruses can grow around us but how many people think of mold as being a problem? While we might simply throw out moldy food because it’s inedible and potentially harmful, black mold is a huge problem in many properties. The spores from all types of mold grow in warm, moist conditions. This makes it very common in countries where there is high humidity and a climate approaching tropical but this doesn’t mean that it won’t grow in other countries too. Did you know that some kinds of fungus and mold can even grow in camera lenses? This is because the mold spores exist everywhere in our environment, even in places where we don’t expect to find them. They lie inert until the right conditions are present. Once there is warmth and moisture present as well as a source of food, the spores will germinate and grow. Surprisingly, in camera lenses, the fungus will actually feed off of the organic oils that are present inside the lens, including fingerprints. Mold is common in older homes where there might be plumbing problems. In fact, one can live for years in a home and not even know that there is black mold anywhere. If there is a pipe leak somewhere or water entering the roof space, it’s highly likely that mold will grow and cause other problems. Scientific research into the health effects of mold is an ongoing process but it’s clear that it can be a huge problem for some people who are sensitive to the spores. For this reason, it’s important that mold and other pathogens are eliminated from the immediate environment in our homes and workplaces. The further implication is that the presence of mold and other pathogens in workplaces can even be the cause of litigation against the company. Just a single case of black mold in an office, for example, can cause a cascade of ongoing health effects ranging from mild to severe that can place the business at risk. Even at the lowest levels, it may result in absences from work due to health problems. If you really want to get rid of mold in your home or place of work, one of the most effective strategies is to use an ozone generator. The problem with mold is that the spores themselves are rather durable and hardy. This means that they’ll even survive bleach and other cleaning products. So, what’s ozone and how does it work to kill off mold? The air we breathe contains O2, or two oxygen atoms bound together into a single molecule. 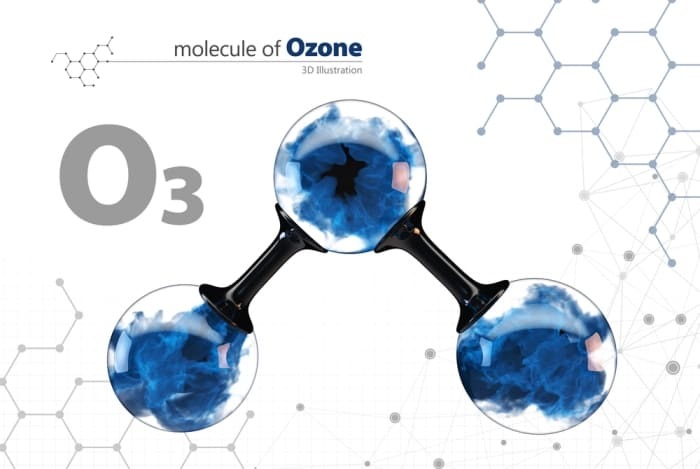 Ozone is different because it contains three oxygen atoms, or O3. Have you ever smelled the air after a heavy thunderstorm and it has a really fresh and invigorating scent? You’re probably breathing in a little ozone. Ozone is naturally occurring and happens when normal oxygen molecules are broken down and affected by UV radiation from the sun. In actuality, the earth has a layer of ozone in the upper atmosphere. Humans have understood how to generate ozone for a long time and the great thing about it is that it can kill off molds. What the ozone does is interfere with the structure of mold organisms and kills them off. This makes it particularly effective at getting rid of hard-to-kill mold spores and the living filaments that form growing molds. Does Ozone Kill Bacteria and Viruses? Just as ozone kills molds, it also kills off pathogens such as viruses and bacteria. The ozone bonds with the cells in the bacteria and the viruses and changes their structure. This kills them off effectively. But is there a danger to excessive use of ozone? The fact is that ozone is dangerous to living things in general in large amounts. Any naturally occurring ozone around us is quickly broken back down into normal oxygen molecules. When an ozone generator is used, it’s wise to understand that it cannot be used to excess. Is There a Good Strategy for Using an Ozone Generator? Given that ozone is both helpful and harmful, is there a better way to use it for a mold or bacterial problem? Even before using an ozone generator, it’s a good idea to thoroughly clean off all of the infected surfaces in a home or workplace. Antimicrobial agents, bleaches, and the physical action of scraping off mold will all help to prepare the area for ozone treatment. Ozone all by itself will not eliminate everything and should certainly not be overused but additional cleaning beforehand will make it very effective as a final step. Once all surfaces have been cleaned and any mold has been identified and treated, it’s time to turn on the ozone generator. An approximate time of three to six hours is usually enough to allow the generated ozone to infiltrate all of the cracks and crevices in an area. After this has been done, the ozone will break back down into normal oxygen in one to two hours. This will then allow the area to be used again for habitation or work. The truth is that black mold, viruses, and bacteria can become serious health hazards when they infect our local environment. Indeed, black mold can hide behind walls and in other areas without being detected for a long time, which means that it can potentially be a source of ill health over this period of time. By using an ozone generator carefully and preparing surfaces properly, it’s possible to eliminate bacteria, viruses, living molds, and mold spores almost completely.